If you neglect them and do not inspect them, pests and diseases can completely wipe out your houseplants. Pests and diseases can affect not only the flower and leaves, but the stems and roots as well. It’s much easier to prevent these things than to eliminate them after they happen. Read on for more info. Buy only clean and healthy plants. This reduces the risk of pests and diseases infecting not only your new plants but your existing ones. If you’re not sure a particular plant is healthy, isolate it for a few weeks, taking care of it and waiting to see if its health seems to improve. This is better than introducing it to a room where there are other plants and chancing that they all become infected. When you water your plants, make it a habit to pinch off dead flowers and thoroughly inspect the plants to see that they’re clean and healthy. If you notice any problems, treat them immediately before the problem infects the whole house. Make sure you only use clean potting compost and never take any cuttings off plants that are questionable in health. Keep in mind that most houseplants underachieve because they aren’t fed regularly. Most people have no trouble remembering to water a plant, but when it comes to the nutrients they need, no one thinks about it. If you give your plants a balanced diet, they will have a better chance of surviving an infestation or disease. But there’s a happy medium. Do not over feed your plants because this can make the compost toxic, which will retard the growth and even kill your plants. Never feed summer-flowering plants after late summer. If you do, it encourages the lush growth that is susceptible to diseases and bugs, just when the plant is shutting down to hibernate for winter. Plants with variegated leaves will become green if the plant isn’t in good light. The flowers on flowering plants become dry and fall off pretty quick if the compost is too dried out or it doesn’t have enough light. Healthy leaves will curl at the edges and fall off the plant if it’s in a draft. Lower leaves on the plant will become crispy if the compost is too dry or the temperature in the room is too hot. If you see a white powdery coating on your clay pots, it usually indicates that the plant was fed too much or that your water contains a lot of chalk. Leaves develop holes in the center or along the edge because people or pets brush by them when they go by. Flower buds will fall off before blooming if the compost or air is too dry, or if the plant doesn’t have enough light. Leaves will wilt if the compost is too dry or if the compost is over watered. They may also temporarily wilt on a hot day. If the compost is too wet, the leaves will wilt and decay quickly. Brown spots and blemishes will occur on the leaves of the plant for a lot of reasons. These could be burn spots from direct sunlight on water drops, or diseases like leaf spot. Green slime on your clay pots happens if the compost has been watered too much. This slime might show up on the surface of the compost as well. You don’t need to know everything about these problems to have healthy plants. Just watch for them. If you need to treat your plants, there are several ways to apply chemicals to them. You can spray them with a concentrated insecticide diluted in clean water. This is the most popular method. Some liquid chemical sprays can be purchased already prepared. You can also water the compost with a systemic insecticide that enters the plant via the root system. They also sell sticks that you can place into the compost for this purpose. Dusting plants is also an effective way to get rid of diseases and pests, but the dust leaves an unattractive residue. This is a quick and effective way to get rid of pests, however. Make sure to distribute the powder evenly and do it outside so you don’t get the product in the air or on furniture. This will prevent inhaling things you shouldn’t! Remember, don’t just water your plants. Check them over thoroughly for anything out of the ordinary. Pay attention! 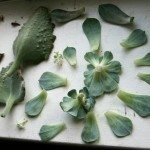 If you nip most of these things in the bud so to speak, you can save your plants!